Last night I decided to hop on the Amtrak and head into NYC a day early. Let me just tell you I'm GLAD I did!! Seriously. As I sit here in my hotel room-an hour before my event starts this morning...I'm thrilled that I'm not rushing to get here this morning. One of the great things about living in Philly is the close access to really amazing places. The Ball Dropped!Traveling is probably one of my most fave things to do of all time. I LOVE it. Whether it's for work-or play. I got up, checked into the hotel and hit the streets. Here's a bit of my fun. I love that they have so may different 'artists' on the streets. And I'm 100% ok with tipping them in every corner! It's really brilliant way to make money, ya know??! haha. Batman! !Anyway-I met and saw a few cool characters. One thing missing? Bubba would have loved it. Ahem...speaking of Bubba. 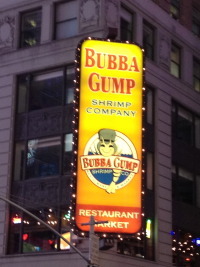 I decided to have dinner at Bubba Gump Shrimp when I saw it! ha. Bubba Gump!Ok. So I'm off to get moving for the Toy Fair. A tasty Hasbro Breakfast this morning. Bring it on.